Joke: Guy knows more about his truck than his wife. A husband went to the police department to file a missing persons report. Husband: Just after lunch, she left to go shopping. Officer: What is her height? Officer: Is she slim or healthy? Husband: Not slim, maybe healthy. Officer: What color hair does she have? Husband: Like a blondish brown red color. Officer: What was she wearing? Husband: Maybe a dress or pants. Husband: Yes, she was driving my truck. Husband: A Deep Cherry Red Crystal Pearl 2500 Dodge Ram 4×4 with a 4 Door Mega Cab, 8.4” uconnect touchscreen with navigation system, premium leather split folding bucket seats (Front and Rear), standard 5.7L Hemi V8 410HP and 429LB-FT of torque, 66RFE six-speed automatic transmission, anti-spin rear differential, classic V 18,000LBS trailer tow package, complete with a Rambox cargo management system and 100,000 mile/5year unsurpassed powertrain limited warranty. It has a small scratch in the driver side door from my wife…. The man began to sob. I hope everyone knows their spouses and family better than this. Obviously the things that are most important to us we know in the greatest detail. Its also amazing how a certain smell or song or pattern can set our memories off to something that happened years ago. Most people from my generation knows what “up up down down left right left right b a start” means. The codes for 99 lives in Contra. Most people from around my generation know the words to “Paradise City” or “Friends in Low Places”. Everyone enjoys remembering the old days. Does anyone remember the “Gooiness” or “Casa Blanca” or “Tron” or “Willy Wonka”? In the past few years we’ve had TV shows like: The Walking Dead, 24, CSI, Lost and much more. These things connect us to each other and as we talk about them. If we live out certain experiences we build strong memories that last for a lifetime. Now days there are too many songs, shows, games and performers to keep up with. We are drowning in all the entertainment available for us. It’s being poured out on us from every avenue of entertainment. TV is not just for the living room or a certain times of the day. We have DVR’s, i-everything, note pads and the like to connect us to the world 24 hours a day. Right now is technologically the perfect time for the prophecies in Revelation to be fulfilled. If it is caught on video, it will be across the world in minutes. There is nothing wrong with our technology, God is not afraid of it so we don’t need to fear it either. God will use our technology for His glory so we simply need to be in tune with His Will. We need to be connected to Him. If we are connected to Him then we can see what is pleasing to Him. People are so enamored by the world that they think the things of the world will help them find their way through this world. They want to learn more about the world. They have built a connection through time spent with the world. It’s all about the times when we do something together. The potlucks, mission trips, Sunday drives, River Cats Games, the Spot, the adventures, we all look back and have those good memories of when we left our comfort zone, our homes, and we lived. We all have those, “I’m glad I did that” or “Why did I do that” moments or “why didn’t I do that”. I should be dead. Or, I wish I was dead. Moments. When Jesus called His disciples it was their chance to live. It was their chance to make those lasting memories. After John had baptized Jesus, and Jesus had just returned from the desert He needed His disciples. Jesus went back to the area where John was because He knew that John was preparing the way for Him. John had just had an encounter with the Pharisees about who Jesus was and he proclaimed boldly his testimony about Jesus. When these two disciples saw Jesus something was triggered in their hearts. The disciples had already been making a connection with Jesus through John. When John said, “Look, the Lamb of God!” it was like the starting gun at a race. LOOK! Do you see Him? Go after Him. He is greater than John. These two were obviously interested in serving God because we see them at work with John. John was head first into his calling. He left everything behind and wearing camel skins, eating honey and locust, he gave his life for Christ. And what a great ministry it was; baptizing many people and announcing the coming of the Lord. The hearts of many people were turning to the Lord through John and his disciples confirming that God was a work. They found the place where God was staying and they joined Him. Today more than ever we need a deep connection with Jesus. I have talked with people that barely know what it means to be a Christian. They hardly know what sin is or why it’s harmful. They can’t tell you why Jesus had to die for them or why His life would save ours. There is so much confusion about God and what love is. So many people associate Christians with the people who don’t do anything accept for judge. It’s probably because the Church is so good at telling the world everything that’s wrong with it rather than being connected to Jesus. We are in a constant connection battle between two opposites. It is interesting to note that we have a strong connection with both the world and with God. When we want to sin our bodies crave it and turn our whole lives around for it. Even if we know it will ruin us. Our sinful nature is always there to remind us of where we came from and what we are a part of. But when our spirit hears the Lord’s voice our spirit turns our whole lives around for Him. Even if we know it will ruin us. Our spirit that the Lord has given life to remembers where we came from and to whom we belong. God’s Spirit is in us to remind us that we belong to Him. One of the two original disciples of John the Baptist was most likely the Apostle John. 1John 1:1 That which was from the beginning, which we have heard, which we have seen with our eyes, which we have looked at and our hands have touched—this we proclaim concerning the Word of life. 2 The life appeared; we have seen it and testify to it, and we proclaim to you the eternal life, which was with the Father and has appeared to us. 3 We proclaim to you what we have seen and heard, so that you also may have fellowship with us. And our fellowship is with the Father and with his Son, Jesus Christ. 4 We write this to make our joy complete. John stayed with Jesus and it showed! Our love for Jesus should show. Our love for Jesus is what makes us want to live for Him. And its what should make others want to live for Him as well. In what ways are we making the connection with Jesus? The disciples followed Jesus because they wanted to know Him. They wanted to know His teachings. Is He in your heart, the very core/center of your being? Is He in your thoughts, desires, strength and decisions? Are we in love with Christ? Our connections with Christ are stronger than the ones we have in this world. Jesus is still calling disciples to stay with Him. It means come and He will become our Teacher and we will become His friends. More then ever we need a friend like Jesus. We need to know that the Almighty God is very approachable. He is very much alive today. The world needs to know that He is interested in our lives and cares about us. We need Jesus to stay in our hearts. This is the place He most wants to be. The darkest part of our lives is our heart so it is fitting that the heart is the place He most wants to bring His glory. His greatest work came at our darkest hour. If we are not approachable then the world will never meet Christ. If we do the things He did then we will forgive, love, show kindness, we will connect many others to Christ. John had to explain that the word Rabbi meant Teacher, so it makes sense that his audience was gentiles or ordinary people. Our world may be connected by satellites and technology but we are connected to Jesus by the Holy Spirit. Jesus asked the disciples what they wanted; it was a personal invitation into His life. We need to spend all day with Jesus. We need to force past all the distractions of the world to find where Jesus is staying. He is in our devotions, in our prayers, in our services, in our good works, in our praises, and in our love. 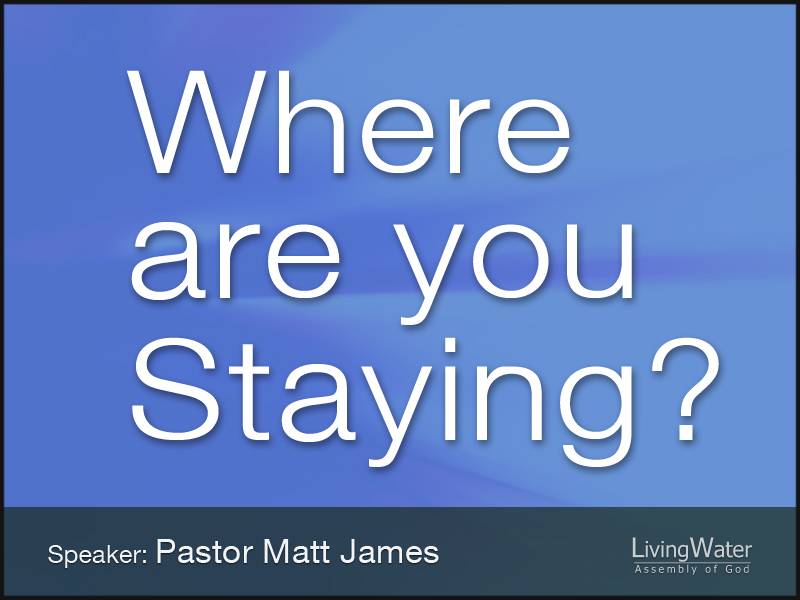 Jesus wants us to stay where He is. When we stay with Christ we will see Him at His greatest works. The wolves seem ferocious until they meet the Lion. We need to take your Word seriously. What is true, good and right is always true, good and right. We need to get close to You. Where is our curiosity for you? We need You to make Your home in our lives. The darkest parts of our lives need Your grace. I want others to be closer to You when they talk with me.